The Kentia palm or Howea forsteriana is an upright palm tree used widely in landscaping both indoors and out. 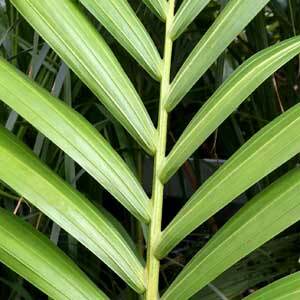 Kentia Palms are available from wholesalers from small seedling trees, to potted specimens suited for indoors use, as well as larger trees for landscaping. Regarded as one of the most attractive small growing palm trees they are one of Australia’s most widely exported trees. Originally from Lord Howe Island they are now grown widely across Australia, North America as well as through Europe where they are commonly used as indoor plants. Excellent for creating a tropical look both indoors and out, it is not only that these palms are attractive, they are also extremely low maintenance. Specimens are readily available in Australia at around 2m in height. The export industry consists of both seeds and germinated seedlings. Landscapers and Indoor plant growers need to ensure good drainage and good filtered light. Soil needs to begin to dry between waterings, outdoors little extra watering will be required except in dry summers. Pruning should be limited to the removal of old dead foliage. Regular applications of a slow release low phosphate fertilizer will be required for indoor plants. Indoors Kentia Palms have a slow growth rate and can be grown in the same container for a number of years if watering and fertilizer is regulated. Wholesale Palm Trees. Large range of palm trees in 45L bags at 5-6 years of age from 1-4 meters depending on variety. Available from QLD to Victoria.